Undersecretary of State to the Ministry of Foreign Affairs – the guest of the EBC Poland . On the 26th of March 2018 upon the invitation of the President Janusz Cieślak, Marek Magierowski – Vice Minister of Foreign Affairs was a guest of the European Business Club Poland. The topics covered at the meeting of the members and sympathisers of the Club which took place in the building of the Warsaw Stock Exchange at ul. Książęca 4 in Warsaw, were the directions of promotion abroad and the range and forms of support given to Polish entrepreneurs on foreign markets by the Ministry of Foreign Affairs. The meeting was also an opportunity for wider debate on the economic relations between Poland and the European Union, the United States, China, India, Belarus and third world countries, as well as on the strengthening of the image and promotion of Poland on the international arena. Podpis zdjęcia: Undersecretary of State at the Ministry of Foreign Affairs – Marek Magierowski and the President of the EBC Poland – Janusz Cieślak. When greeting the guest, the President of the Association reminded everyone about the flow of professional career of the Minister and emphasised the currently occupied post – undersecretary of state for economic diplomacy, American, Asian, African and Middle eastern politics. He said that investing abroad can have many advantages but it requires a very good knowledge of local markets and obtaining the desired effects is connected with allowing for that much more time than one would when investing in one’s own country. 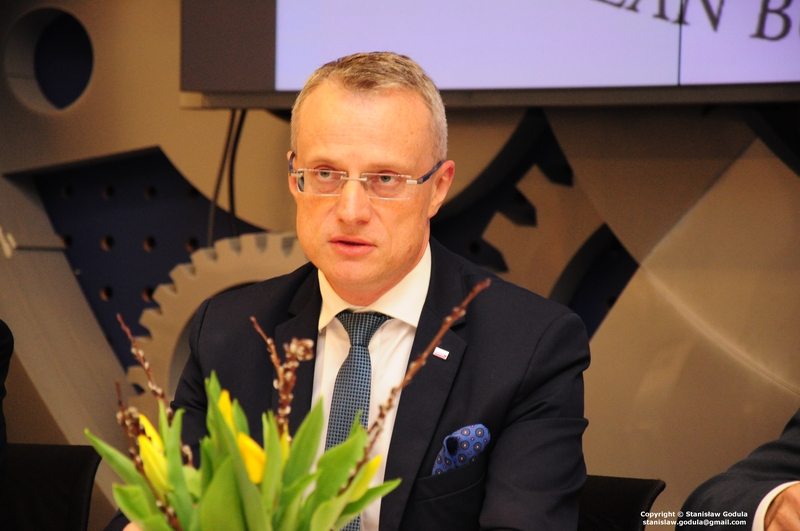 When giving his speech the Minister Marek Magierowski said that Polish companies more often are present on foreign markets even such which until recently seemed to be exotic and little accessible. They are often pioneers and therefore, they cannot rely on the experience of their predecessors. The problems which they face require solutions that take into account the local legal and social specifics. Despite many difficulties Polish companies are active in searching for new sales markets. The role of the Ministry of Foreign Affairs is above all creating an easy access for Polish entrepreneurs to foreign markets. The Ministry gives complex information both in the area of economy and those connected with everyday life and social moods in a given country. Entrepreneurs often expect help in complicated or non-standard situations. This is often in the case of so called “though markets” where the barriers of entering the market are high and the legal regime is not very clear to us and is definitely different from the one existing on the unified European market. On the “though markets” mechanisms making it difficult for foreign investors to enter the market are used which makes it necessary to undertake actions within the economic diplomacy. Individual interventions or official meetings with the participation of diplomats do not only open the doors but they also help in solving specific problems. The Minister emphasised that Polish companies can count on the support of Polish diplomatic posts and ambassadors. In particular the Ministry of Foreign Affairs undertakes various non-standard and often indispensable activities in order to effectively solve the problems of Polish entrepreneurs investing abroad. If Polish business is discriminated against the intervention of a diplomat is absolutely necessary. It is not only the sheer act of objection but also the effect of a positive solution of a given problem. Currently the Ministry of Foreign Affairs is working on solutions aiming at strengthening procedures and better equipping the posts, so that they can undertake effective actions in the interest of Polish business. The success of Polish entrepreneurs in the area of international expansion is not only the result of cost advantages. Polish economy is characterised by high innovation and very high level of production, which in connection with relatively low costs decides on the competitiveness of Polish companies. The ratio of quality to costs results in the more frequent presence of Polish entrepreneurs on demanding markets and they don’t have to be companies in the big scale production. It is worthwhile to look at companies which were successful in order to build one’s own development strategy based on their experience. Minister Marek Magierowski emphasised that today Poland’s strategic interest is to pay attention to development and expansion of Polish companies. That is why during official visits apart from the political agenda on the one hand there is also a possibility to present to that country’s administration exemplary Polish companies which are ready to enter the local market. On the other hand companies have the possibility to show their offer and ideas for the investment in a given country. At the end not only those who make final decisions on the choice of products or obtaining business partners, but also the top level members of the administration of a given country get vast information on the Polish offer. If such presentation and exchange of information takes place within an official mission of the Polish government then the partners receive an important signal that the company is trustworthy. In second part of the meeting participants had an opportunity to take part in a discussion and an open conversation with the Minister – Marek Magierowski. The meeting ended with a cocktail during which everyone could individually talk with other participants exchanging own experience and opinions on such an important matter. ← The Ambassador of Hungary to Poland – PhD Orsolya Zsuzsanna Kovács – a guest of the European Business Club Poland.